Live Classes On Tuesdays & Thursdays! Join us on LIVE on Instagram or Facebook for short 10-15 minute classes on saving money and eating healthy. Tuesday and Thursday mornings, 7:30 or 8:00 AM CST. Are you more of a reader, listener, or watcher? We all learn a little differently. While one person needs to read something to really understand it, others need to hear it, or maybe even see it in front of them. In our house, some small people need to learn while doing – playing with it, schmearing it across the table, spilling it on the floor, forgetting about it and letting Mom clean it up…. For myself, I prefer the written word. I love reading, I love words, and that is a very natural way for me to learn. But for those of you who prefer face-to-face and auditory learning, we started a new series of LIVE classes over on Instagram and Facebook! If you don’t follow us there, join us here on Instagram (my personal favorite and where we are most active) or Facebook. Most Tuesday and Thursday mornings, at 7:30 AM CST (Instagram) and 8:00 AM CST (Facebook), I teach a short, 10-15 minute class on a single aspect of saving money and eating healthy. 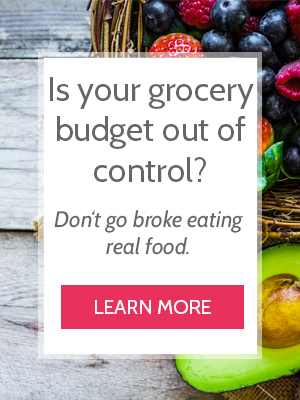 We tackle subjects like How to Build YOUR Frugal, Real Food Pantry, simple meal prep, food budgets, and recipes. Ideally, I’ll save these to Facebook, IGTV, and their coordinating Blog Posts. So if you miss the Live Class, you can catch it in one of those places after. If you get the Cheapskate Cooks’ 1-Min Email, you will be notified of most of them. If you haven’t joined the Cheapskate Cooks, join here for free! Want to hear how we navigated dairy allergies on a tight budget? Need to talk Whole30 on a Budget or how we fed our family of 5 real food for $90/week? Have a favorite recipe you’d like to see demonstrated? If you have a request for an upcoming Live Class, let us know in the comments below or email us here!